Today, more and more Western health practitioners are recognizing what doctors in Asia have known for over three millennia: acupuncture works. It relieves pain, helps treat difficult health conditions. In fact, a recent National Institutes of Health study that evaluated data on more than 18,000 patients revealed that acupuncture exceeded the “placebo effect” and was actually more effective at providing pain relief than painkilling drugs. Here at Absolute Wellness Center in Eugene, we have our very own highly-skilled and experienced acupuncture and Oriental Medicine practitioners, Mary Ann Petersen, LAc, Margy Campbell, LAc, and Amber Campana, LAc. 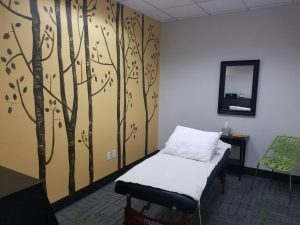 They are both very experienced and skilled with both traditional needle-based and non-needle-based acupuncture, acupressure and Chinese massage, helping patients find pain relief and deeper healing. Although the exact mechanisms behind the proven effectiveness of acupuncture are still being studied, it is very clear that non-invasive, drug-free acupuncture can help people with a wide range of health issues. It clearly has biochemical impacts that change the way the brain interprets pain and has a healing, balancing effect on the function of internal organs and systems. Our acupuncturists help people overcome everything from back pain, neck pain and headaches to women’s health, and mental health concerns. 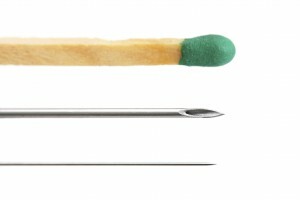 An acupuncture needle is only .25 mm thick! That is less than 25% the thickness of the sewing needle showed here! During an acupuncture appointment, your acupuncturist will insert sterile, one-time-use, hair-thin needles into very precise points in the body. 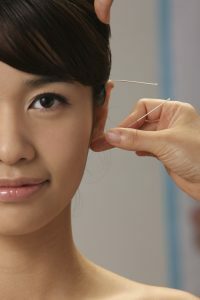 Acupuncturists are highly skilled at needle insertion, so most patients feel nothing when the needles go in. Some feel just a tiny, momentary prick like a mosquito bite. Our acupuncturists are also skilled in using non-needle forms of acupuncture, acupressure, and Tui Na (a form of Chinese massage that corresponds with the acupuncture points). The methods chosen will depend on the patient’s condition and comfort level. During treatment, most patients feel a sense of deep relaxation — many even fall asleep! Because acupuncture is about healing the source of the pain from within, it may require several sessions over the course of a few weeks for the deepest level of healing (sessions last about 45 minutes to an hour). Nevertheless, many patients report welcome relief from their health concerns after just a few sessions. We love acupuncture; because it works and because it approaches healing with a unique and specialized angle. By getting at the root of a problem, we can alleviate the pain and help our patients achieve lasting, natural health without drugs and invasive procedures. To ask any questions about acupuncture or to set up an appointment, please call us at 541-484-5777! More information is available on each of our acupuncturists on their individual pages. Mary Ann Petersen, LAc is known for her gentle technique, good humor, and her page shares links to many of her articles published both locally and nationally on health and well-being. If you are new to acupuncture, you may particularly benefit from her articles Should I Consider Acupuncture?, How Does Acupuncture Feel?, and What is dry needling and how is it different from acupuncture? Margy Campbell, LAc has nearly 20 years experience in acupuncture, Oriental Medicine, and Herbal Pharmacology. After working in community health centers for many years in addition to her private practice, Margy prides herself on making acupuncture comfortable and accessible for patients, encouraging patients to ask questions, and creating a warm healing environment of trust and relaxation. Amber Campana, LAc specializes in women’s health, sports medicine, pain management, mental health and palliative care. Like Margy, Amber strives to ensure every patient question is answered in language they will understand so they feel safe and empowered throughout their healing journey. Acupuncture is an alternative method of healing that is used for a variety of conditions and helps our patients relax and improve their overall health. Who can perform acupuncture treatment? Our acupuncturists at Absolute Wellness Center in Eugene, Oregon have extensive training both during and after their schooling, maintain active licenses in the State of Oregon, and stay up to date on current research in their fields to provide the safest and most effective treatments. Your acupuncturist will be able to perform therapeutic acupuncture, stress-relieving acupressure and Tui Na, a type of traditional Chinese massage that works in conjunction with the acupuncture points. What will happen during an acupuncture treatment? Your acupuncturist will start by giving you a thorough evaluation to find out exactly which types of treatments you should have. These treatments may involve the use of sterile, disposable and extremely thin needles that will be tapped gently into the skin. Your acupuncture session should feel relaxing, uplifting and invigorating. After treatment, you may experience very light bruising occasionally, although this does not typically happen. Every condition is different, and the number of treatments you will need will vary depending on your specific condition. 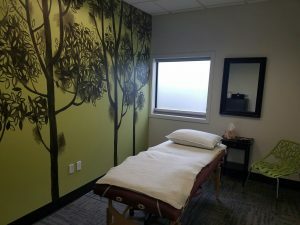 Your treatments might also include a few techniques that do not use needles, including acupressure and massage therapy. 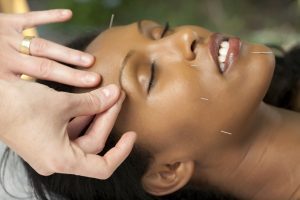 Do I need a medical referral in order to see an acupuncturist or to receive an acupuncture treatment? Not necessarily. An acupuncturist is considered to be a primary care provider so a lot of insurance companies will cover this type of alternative health treatment without a referral. Always make sure to talk to your insurance company to find out if this type of treatment is covered before you make an appointment. Should an acupuncturist use disposable needles? Yes. The needles used during your specialized treatment should always be sterile, disposable, and never reused. It is both unhygienic and unprofessional for any acupuncturist to reuse a treatment needle again. Like all needles that are inserted into or underneath the skin, reusing them could pose potential health and safety risks and could cause infections. Can an acupuncturist give me injections? Never. A licensed acupuncturist should never give out injections of any kind and should never perform any type of treatment using a hypodermic needle. If you need to have an injection of any kind, such as a vitamin injection or a glucose shot, contact your medical doctor. Although an acupuncturist is highly skilled at inserting acupuncture needles into the skin, they are not trained to insert hypodermic needles into the skin or to give injections. Can I try acupuncture while receiving other types of care? Yes. Acupuncture is very often part of a comprehensive treatment plan including multiple providers. For instance, acupuncture may help someone with pain relief during the acute stages of their injuries, while undergoing chiropractic care or physical therapy to treat other injuries or address the same injury in a complementary way. Your provider can talk with you about your treatment options. If you want more information about our acupuncture treatments, please call the our office at 541-484-5777.